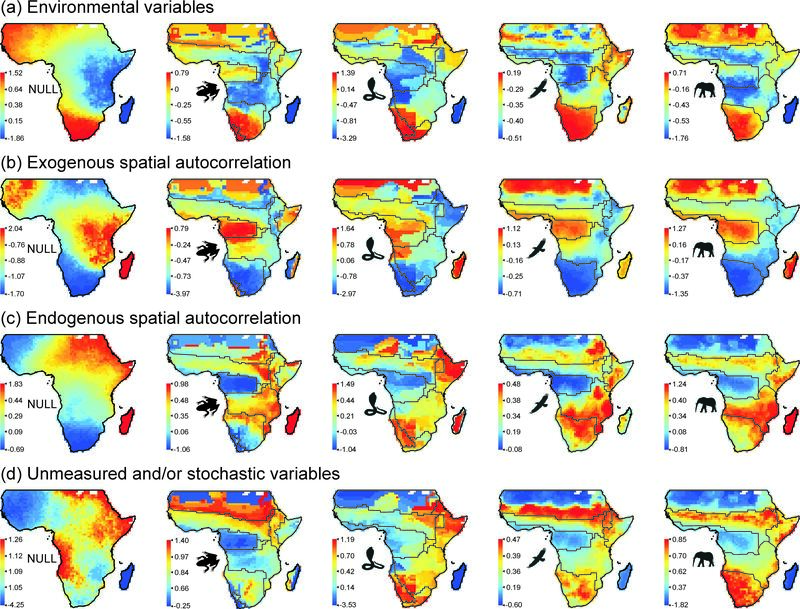 In our latest study just published online at Ecography, we set out to quantify the degree of environmental correlation, exogenous and endogenous spatial autocorrelation in the distributions of 4 423 species of amphibians, reptiles, birds and mammals in Africa. 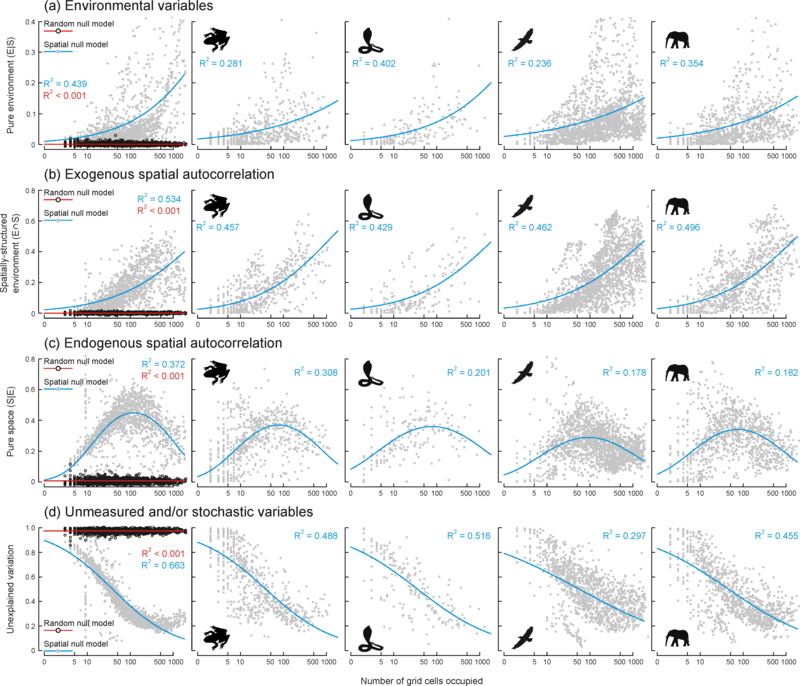 We used variation partitioning to decompose the variation in species ranges into three components of environmental correlation (E|S), exogenous (E∩S) and endogenous spatial autocorrelation (S|E). Variation partitioning assumes that the total variation in a phenomena always sums to 1 (100%). Each of the three components (E|S, E∩S, S|E) are proportions of the total variation. This also allows us to calculate the proportion of unexplained variation using simple arithmetic. In addition, we also simulated two different null models to test whether patterns for real species are indicative of true underlying ecological mechanisms. The first null model (Random Model) scattered simulated species randomly across Africa. Because these simulated species were not constrained by dispersal or environmental conditions, any variation in their ranges would be due to the extent of their distributions. The second null model (Spatial Model) was a spreading dye model, which assigned a simulated species to a random starting point and allowed it to expand it range into adjacent areas, regardless of environmental conditions. Any variation is these simulated species would be due to the combined effects of range size and range cohesiveness caused by dispersal limitation. Our results surprised us. As the extent of a species distribution increases, so does the amount of variation in it range explained by environmental associations (E|S) and exogenous spatial autocorrelation (E∩S). The amount of variation explained by endogenous spatial autocorrelation (S|E) had a hump-shaped relationship with range size. Unexplained variation decreases when species are more widely-distributed. The Random null model failed to demonstrate any of these patterns, indicating that they are not merely the consequence of range size. Unfortunately, similar patterns appeared in the Spatial null model. This suggests that the general effect of range size observed in real species is due to range-cohesiveness cause by limited dispersal and not explicit climate-based ecological mechanisms! This raises doubts about the usefulness of climate-based species distribution models because we failed to find evidence for causal relationships between climate and species distributions. However, not all patterns were spurious. When we looked at the residuals of the relationship between the variation components and species range size, we uncovered something remarkable. Species with more or less prevalent environmental and spatial patterns in their distributions (compared to an average species with the same range size) tended to co-occur. Moreover, these patterns of co-occurrence coincided almost perfectly with the boundaries between biogeographical regions in Africa! What’s more, these clear biogeographical patterns did not arise in the simulated species. These biogeographical patterns suggest that the importance of environmental associations, exogenous and endogenous spatial autocorrelation depend on geographic locality and the biogeographical region in which species occur. This may indicate that the importance of underlying ecological processes (i.e. dispersal-based vs. niche-based mechanisms) are not universal, but are instead the consequence of the same historical processes that shaped biogeographical patterns in Africa. This entry was posted in Academia, Africa, My Research, New ideas, Species distributions and tagged Academia, Biodiversity, Biogeography, climate, Cool animals, Ecology, PhD, Publishing, science. Bookmark the permalink.